Queen Christina of Sweden, during one of the stormy discussions with the Chancellor Count Axel Oxenstjerna, who was reproaching her not to be attentive enough to the interests of Sweden, said that she would better contribute to the destiny of Sweden by considering the wider horizon of Europe. The 40th International Furniture Fair whose opening I have the great honor to attend, expresses the intent of the Swedish business community, and namely of the Swedish furniture industry, to address itself to the European market as a whole, developing the potential capacity embodied in its system, based upon a long lasting tradition of an effective mix of craftmanship and industry. By European market I mean the Europe of the 18, including both the 6 countries adhering to EFTA and the 12 countries of EC which are progressively engaged in achieving their political integration through the acceleration of the Unified European Market. I do not know if by midnight of 31 December 1992 all the barriers to the free circulation of goods, money, people and services will be abolished among the 12. But certainly it will be a big step towards the goals that the EC countries wish to attain in order to change, integrate and reshape a socio-economical system – for too long stiffen by a spirit of conservation and exaggerated protection of the national markets and corporations – both uncomfortable heritage and symbols of historical separations and fratricide struggles. Let me express, here and today, the hope that Sweden and other EFTA countries will participate to such a challenge, looking at the adhesion to EC as a way to make possible the refundation of Europe and the definition of the rules of the European game. So, we look respectfully at the necessarily cautious on-going talks between the Swedish Government and the EC Commission in Bruxelles, after November 1990 when the Swedish Parliament has assigned the Government an explorative mandate. First one is that it will make easier for me to perform my pro‑tempore job as President of UEA. 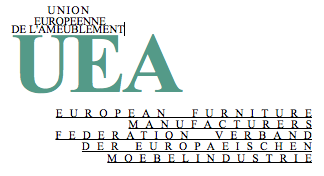 In fact, UEA is a confederation representing the national representative professional associations of the furniture industry both within the EC and EFTA. The second reason relates to the leading role that industrialists and businessmen and women are playing in implementing their “peaceful revolution” towards a Unified Europe. We have, as industrialists, a great responsibility regarding such a purpose. a new equilibrium is found – despite the great discrepancies still existing among the starting points of the different European countries – between the Governments and the industrial and economical systems. What SMI (the Swedish Furniture Industry Association -Sveriges Moelindustriforbund) is doing is quite consistent with the above role of the industry. The statements that Jurgen Engels, president, and Jon Klegard, Managing Director, made at the opening of the 39th Furniture Fair, published in the magazine Good News and the growing activity in 1990 and its programs for 1991, show how SMI works to create, through the best possible combination of competition and cooperation, the most suitable ground for improving the professional level and the effectiveness of the Swedish furniture industry, with a growing vision towards a European horizon. Nevertheless many European believe that Europe without Sweden will be less European. Let me speak about furniture, now. The European furniture industry with about 48 billon ECU (370 billion SEK) of production in 1990 and employing over 1 million people is quite dependent on changes in the economic situation. The elasticity of the demand, mainly in residential furniture, towards disposable income is close to 1.4 – which in other words means that the overall purchase of furniture is very much affected by the increase and decrease of the propensity to consume. In october 1990 the perspective for 1991 was favourable – for the EC, the growth of our industry was foreseen at around 4% as an average, although the average growth of the European citizen’s income was forecast at little higher than 2%. The trade interchange among the EC countries (excuse me if I quote only official EC figures) increased from ECU 3,3 million (25 billion SEK) in 1981 up to 8,9 million (68 billion SEK) in 1990. The recent changes occurring in Eastern Europe have reduced the imports from the COMECON countries, without, in the short term, transforming them into interesting markets. Perhaps in the future they will be so. Also at present, we have to face the threat of the economical consequences of the Gulf war and the unpredictable fall out of the post-war effects. As far as the Swedish furniture industry is concerned, we know that although the aggregate production 1980-1990 has grown from 3 billion SEK to 7 billion SEK, it now suffers from a slight decline in the trade balance, since the export has increased in value by 3,9% (9,2% towards EC markets and 0,5% towards EFTA markets) and import has increased by 19,2% (25,9% from EC and 7,8% from EFTA). Nevertheless, as I have already mentioned, your industry has a potential to exploit and a substantial reserve of enegy. The breath of fresh air from young designers, very well expressed by the project SWEDEN NEXT, will be certainly well received by the industry as a stimulus to actively adapt itself to a new scenario, which brings with it so many structural changes affecting the trade, the regulatory environment including harmonization of standards and certification criteria, the shape of market segmentation etc. Within such a new setting, every furniture firm should define and put into operation clearly targeted strategies consistent with its own strong points and aimed to reinforce, or to make from nothing, its own niche, whenever possible. So, let me express a warmest wish to the best success of the efforts made by each one of the Swedish companies and by the whole of the Swedish furniture industry. I am expressing such a wish not only because I am a polite person, and I like to be pleasant to my hosts, but, much more than that, because the European and worldwide contemporary furniture sector has a debt towards Sweden. Just after the war, when Europe was trying to recover and to rebuild itself, the language of Swedish furniture was so simple, functional, human, in some way in harmony with peace. How greatly our peace has been violated at the present moment, has offered people the furniture appropriate to meet their demand for a new environment, clear and easy to leave in, making explicit the desire for the new. Contemporary furniture design – the Italian design more than anybody else – owes to the Swedish furniture design (the Swedish Modern) which has derived from the vernacular of the 19th century Swedish craftsmen. Please, allow me to exhort the Swedish designers and industries not to become too “international”, and to carefully maintain an organic and strong connection with the rooths of your design. You, more than others, can contribute to the diversity of the European furniture designs. Such a diversity being a real proof of the wealth and the vitality of Europe, as well as the different cultural identities are a marvellous characteristic of our continent. Now I should like your permission to end with a personal remembrance, which comes back to my mind each time I think of Sweden. Some years ago, in winter time, I was visiting the Woodland Crematory designed by E G Asplund. Under arms, I had a large folder containing the drawings of several furniture of the great Master given to me by his son Hans Asplund. Erik Gunnar Asplund, as you know, may be considered the connecting ring between the most noble vernacular and the “Swedish Modern”. Those furnitures were to be reconstructed and offered to the market by Cassina, the Italian company I was the President of, at that time. I decided to open up one of the drawings to better appreciate its value and meaning, being close to an E. G. Asplund architectural work. At that moment, a small group of fallow deers appeared on the snow covered open space, and ran smoothly in front of me as far as the other edge of the plane. I was astonished, my emotions were touched. I understood, at that moment, how great is the contribution that Sweden has given and is giving to the quality of life, that slice of quality of life springing from an environment, an architecture, a piece of furniture.